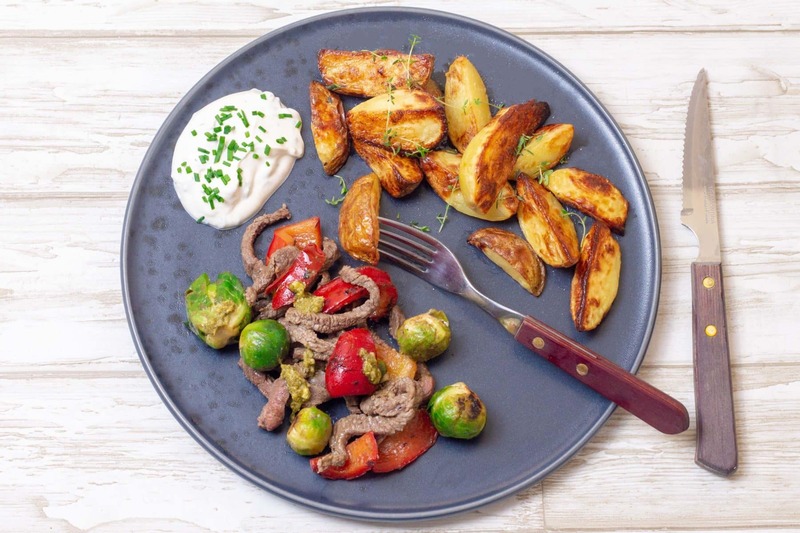 An easy and tasty round of dinner with beef strips, which we're frying along with Brussels sprouts and bell pepper and serving with crispy potato wedges. And the Brussels sprouts have a size that allow the less vegetable-able to pick around them..! Enjoy! 1. Preheat your oven to 225 degrees convection and cook the potato wedges according to the bag. You can of course also make your own from scratch. 2. Rinse the Brussels sprouts, cut off the bottoms and remove the outermost leaves. Rinse and clean the bell pepper and cut into strips. Now cook sprouts and bell pepper on a pan with a bit of olive oil for about 5 minutes. 3. Add pork strips and let them cook along for 5-10 minutes before serving, so the pork doesn't dry out. Finally add pressed garlic and honey and season to taste with salt and pepper. 4. Serve pork strips and veggies with the crispy potato wedges and your choice of dressing. Click the chefs' hat to get the recipe for our chive dip. Tasks for kids in the kitchen: Let your kids help pick off the Brussels sprout leaves. They can also mix the dressing, if you're making it from scratch.